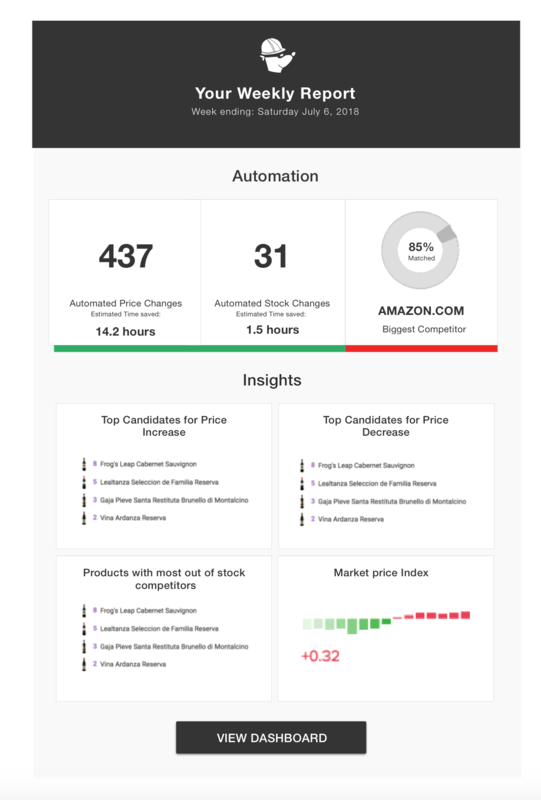 PriceMole An easy-to-use solution that automates competitor price tracking, repricing, drop shipping and more for you! 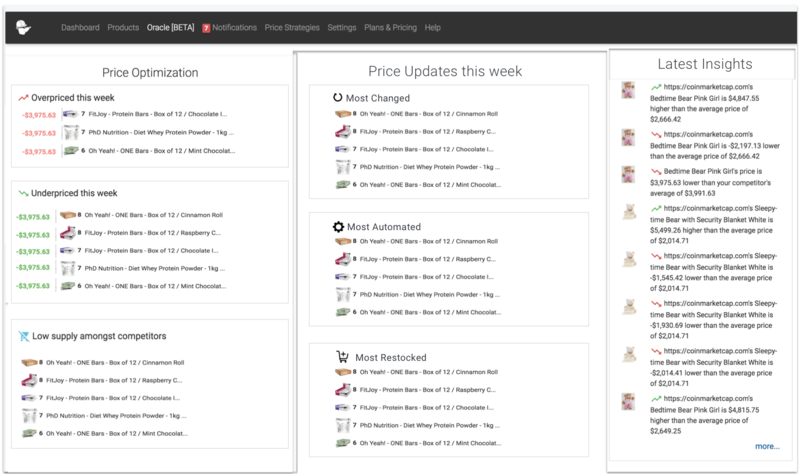 Trends of the week: Here you can see the number of automated changes to your prices and stock. Additionally it displays the most active product, which means product with the most changes overall, probably a product to keep an eye on. App Overview: The top bar displays how many products you are selling, what percentage and number of these you have tracked, and of them which is your top competitor to keep an eye on. Competition over time: This graph takes a look at your top 5-10 competitors and ranks them against each other. You can see who should be influencing your pricing stratgeies. Soon we will be displaying your own ranking on this graph as well, so you can compare yourself to your top competitors. Price Change History over Time: This graph lets you understand seasonal trends. Summer is coming to an end in the nrothern hemisphere so this is a big time for sales and it will be reflected in the amount of changes you see. Competitor graph: This graph displays all your competitors and how many products you have tracked for each of them. Price Optimization: Grow margins by optimizing pricing in your catalogue, this data is not only actionable but also profitable. Here you can also detect anomolies in the pricing, it will also indicate any prices that are wrong and should be disregarded. Price Updates this week: Check your most updated products to review new pricing opportunities. Use products with most out of stock competitors to reference new pricing strategies that allow for better pricing and evaluate most restocked to forcast future sales. 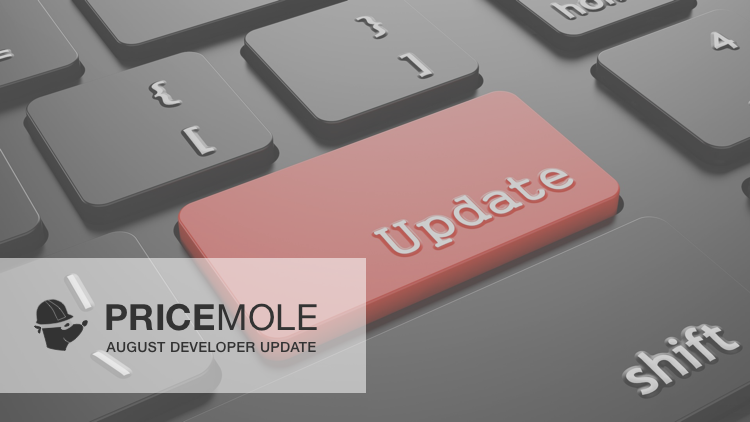 Latest Insights: This is a realtime update of the latest insights being extracted by the moles, used to train our prediciton models to offer in depth sales and price predictions in the future. Don't forget to take a look at the new weekly reports sent out to you every Sunday at midnight. The email displays the most important data gathered throughout the week.